A companion to Bye-Bye Binky and I Use the Potty (both 2016) aims to help little kids take charge of big feelings. 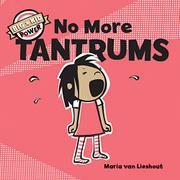 The cover art, rendered digitally in a limited palette of coral, brown, black, and white, contradicts the title right off the bat, as it depicts a child of color with light brown skin and shoulder-length, black, straight hair in midtantrum, her mouth agape, limbs rigid, eyes screwed tight, and tears shooting outward. The first-person text looks back to “When I was little and I didn’t get my way, I cried.” An accompanying series of pictures shows her making demands in various stages of a tantrum. She really loses control when her father, depicted with similar coloring and short, black hair, denies her a cupcake. At the height of her fit, the text shifts to the present tense and asks, “Do I still throw tantrums?” This prompts a page turn that signals how she’s found ways to calm herself, since “BIG KIDS DON’T THROW TANTRUMS.” She “take[s] a little break,” she takes deep breaths in and out, or she might get a hug from her dad. When he tells her again that she must wait for a cupcake, she good-naturedly says “A BIG KID’s gotta try!” A satisfying vignette in the backmatter note to caregivers shows her rewarded with a treat after all. WHEN SOPHIE GETS ANGRY--REALLY, REALLY ANGRY . . .